Jeff Garcia Takes Metblogs Advice? Back on February 27th, 2007, I suggested to the Gilroy born, San Jose State, San Francisco 49er quarterback, and then free-agent Jeff Garcia via a San Jose Metblogs post that he choose the Oakland Raiders. It looks as though he finally got around to taking my advice and has just signed with the Raiders as a backup quarterback. Will he once again be spotted in Willow Glen? Posted in Gilroy, News, Sports, Willow Glen | Comments Off on Jeff Garcia Takes Metblogs Advice? 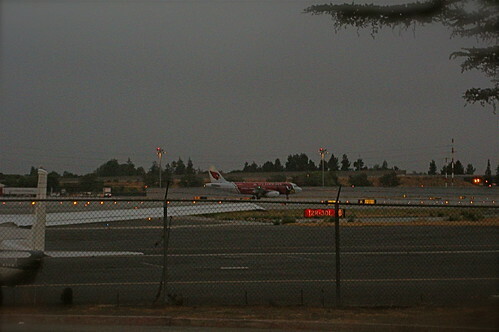 I spotted this beautiful ‘US Airways – Airbus A319 -132 – Arizona Cardinals’ waiting for take-off at SJC this morning. The Cardinals are scheduled to meet-up with the Oakland Raiders (McAfee Coliseum) on Aug. 23. I wonder which of the local fields the Cardinals will be using for practice?